Festive Snowman Egg Cup - SOLD - Thank you!!! This sweet snowman fellow is a two part candy container. Lift his head to reveal a decorated egg cup below. He wears a sculpted top hat with a black glass glittered band. Tall arching eyes, rosy bulbous cheeks, a red ball nose and a jolly "o" mouth add personality to this character. A pair of painted Christmas trees mark the front and back of his egg cup base. Arching bands of red and cream with garland dots, connect the design. Wiry arms with red felted mittens are raised to welcome the season! A black wisp collar and red wisp cuffs give him extra texture. A red vintage crepe paper bow tie is the final festive touch! He is lightly dusted with mica for added snowy shimmer! 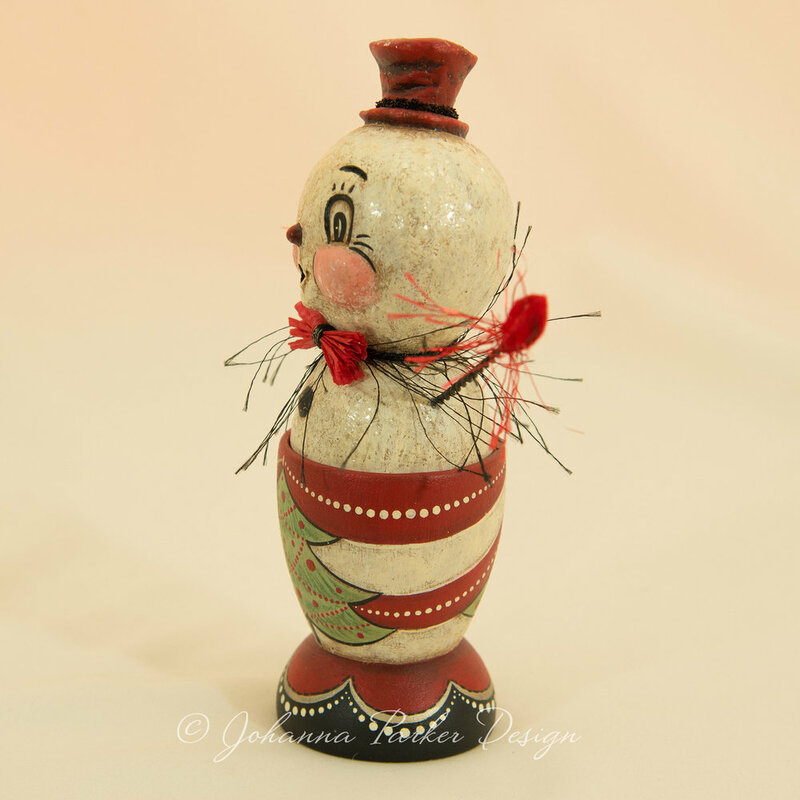 This little snowman made a few cameo appearances in Johanna's current Where Women Create magazine article! Can you spot him? A Johanna Parker Design original!